Last week I was working on hosting an ASP.NET site in Windows Server 2012. As this was my first time to work with Windows Server 2012 I faced several hurdles. Somehow I managed to install IIS on it. There are tons of articles online to help me out. I found "http://www.iis.net/learn/get-started/whats-new-in-iis-8/installing-iis-8-on-windows-server-2012" this one was very helpful. Here I am not going to discuss how to install IIS. Hope the above article helps you too. After installing IIS I configured my site. But it is not running, throwing some handlers error. Oh crap. I need to register ASP.NET into IIS. But irony was that “aspnet_regiis –i” not working. It throws an error. "'aspnet_regiis' is not recognized as an internal or external command, operable program or batch file." 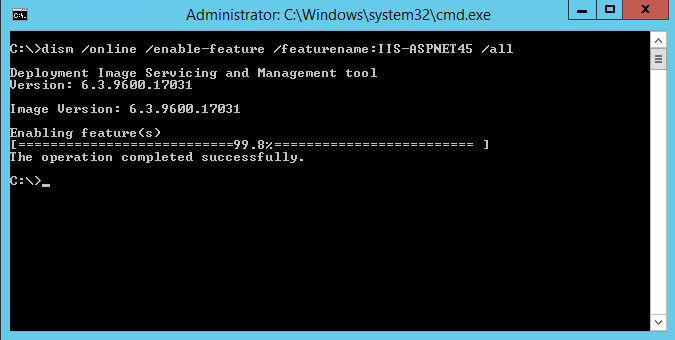 After couple of hours of searching I found aspnet_regiis is no more supported on Windows Server 2012. Microsoft introduced and new tool called DISM. Deployment Image Servicing and Management. DISM can deploy services into your operating system from a Windows Image or from internet. This is the first parameter. It gives us an option from where to install the service from and Windows image or from online. Here /all tell DISM to install all dependency of ASPNET45. Finally my ASP.NET get installed on Windows Server 2012.